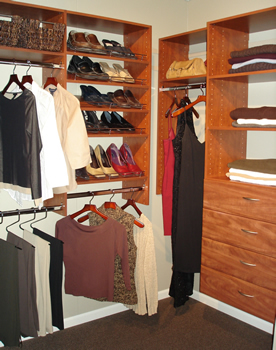 We insist that organizing a closet should be simple, fun and affordable. Family-owned and operated for 23 years, we are committed to providing the best value in closet & garage organizers. your space to the fullest. Whether you’re a do-it-yourselfer, or seeking full service, you’ve come to the right place! Keep it simple. Let Closet Logic show you how. Your time is valuable.� If home projects aren�t your idea of �fun,� Let us take care of everything.�� We�ll have a system designed & installed within 2-3 weeks of your initial phone call.